Previously we mentioned about Atom based Qseven form factor design released by Portwell targeted for embedded market, now seems that MSC Vertriebs has announced a similar design as an alternative for system builders. 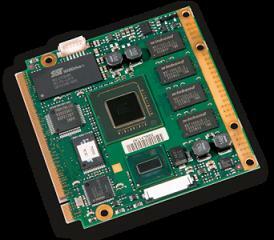 Named as MSC-Q7-US15W-FD, the module is about the size of a credit card integrated with both Intel Z530 at 1.6GHz (or Z510 at 1.1GHz) and SCH US15W north/south combo chipset while still able to be extended via a standard Qseven/MXM connector with other feature enhancements. Measured at 70 x 70mm, there is not much board space available for other features except an optional on board flash storage of up to 4GB. Not to worry about lacking of other features such as the PCI Express x 1 interface, 1GB of memory down RAM, dual display with LVDS and CRT support, USB 2.0 x 8 ports, Gigabit Ethernet, HD Audio, SATA 2, SDIO, LPC and many more, as they can be extended easily depending on needs and usage models. Apparently, MSC Vertriebs design utilizing smaller foot print Z5xx processor and US15W chipset has able to pack more feature as compared to Portwell design that is based on Z5xxPT large package silicon which can withstand extreme temperature environment. No pricing information yet, the module is already available now and is capable to run with any Linux or Windows Operating Systems suitable for mobile and portable applications since it is based on Intel Architecture.